Signed and dated at bottom center of the obverse, "1911, GEMITO"
The severed head of Medusa stares out from the convex face of a two-sided relief. Its psychological realism, simultaneously beautiful and hideous, reveals the conflicting yet symbiotic emotions of attraction and repulsion. This combination expresses the power of ancient Greek apotropaic objects, charms that warded off evil. 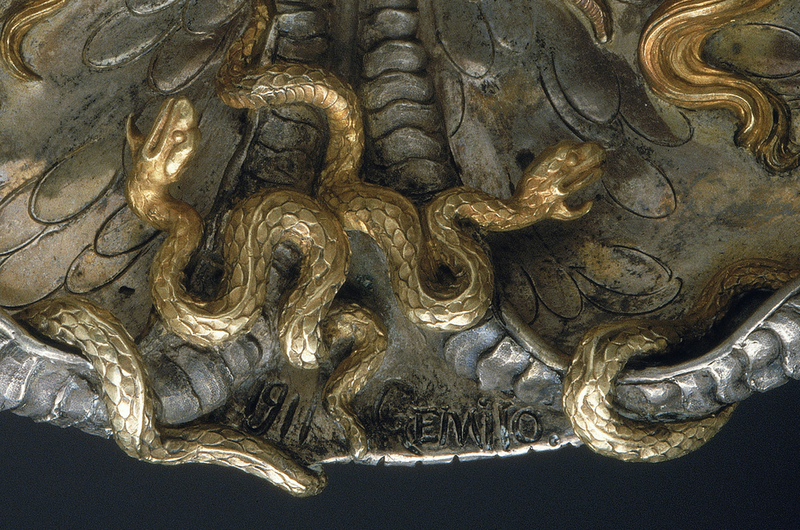 Since the sight of Medusa's face--transformed by the goddess Athena into a monster with snakes for hair--had turned men into stone, it became a traditional apotropaic symbol. 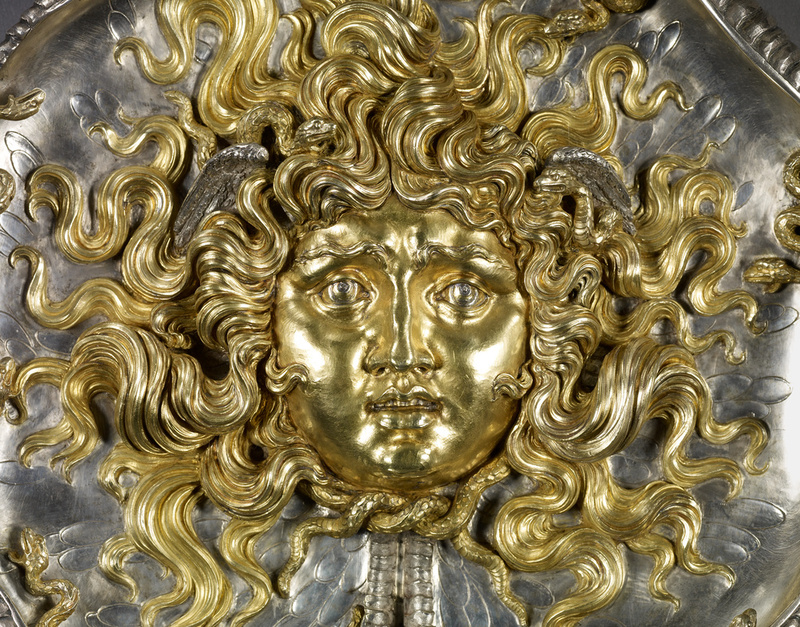 Athena affixed the actual Medusa's monstrous head to her shield, and human warriors followed suit. The sculptor Vincenzo Gemito derived his composition from the famous antique cameo, the Tazza Farnese, but transformed it into an entirely new kind of sculptural object. He revived Renaissance techniques of lost-wax casting to make the relief. 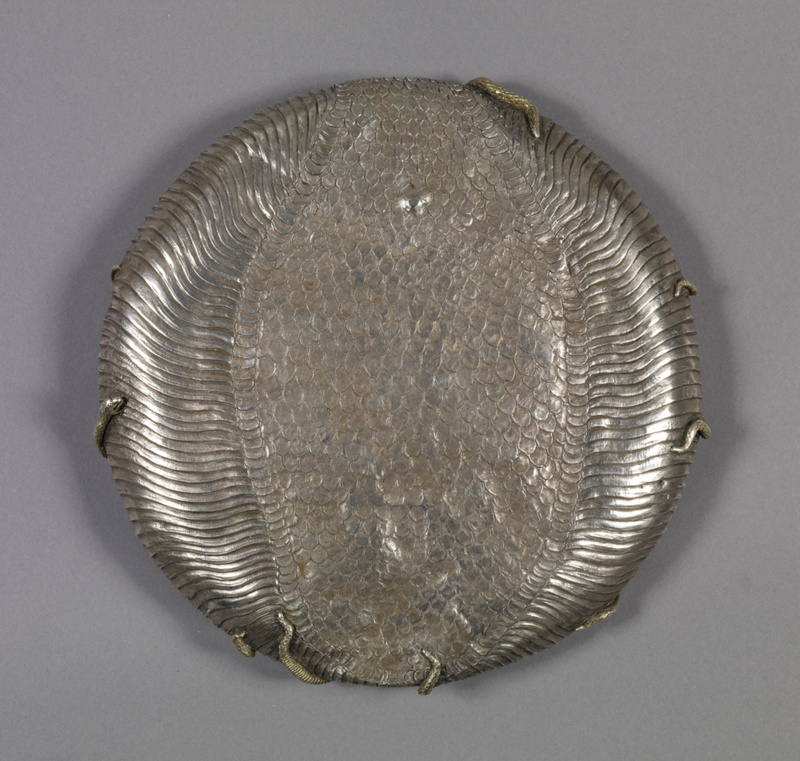 Although he concentrated on the face of the two-sided, glistening metallic relief, he textured the back with snakeskin. Piero Corsini Inc. (New York, New York), sold to the J. Paul Getty Museum, 1986. Antonelli, L. "Vincenzo Gemito a Roma: La sua Medusa e la sua Sirena." Tribuna (28 April 1911). "Cronaca." Arte 14 (March-April 1911), p. 148. Esposizione internazionale di Roma, 1911: Catalogo della mostra di belle arti, exh. cat. (Bergamo, 1911), p. 13, no. 37B. Scarpa, P. Artisti contemporanei italiani e stranieri residenti in Italia (Milan, 1928), pp. 111-12, ill.
Somaré, E., and A. Schettini. Gemito (Milan, 1944), p. 201, pl. 57. Guida, G. Vincenzo Gemito (Rome, 1952), unnumbered plate. Art News 82 (December 1983), inside cover advertisement. "Acquisitions/1986." The J. Paul Getty Museum Journal 15 (1987), p. 221, no. 126. Fusco, Peter. 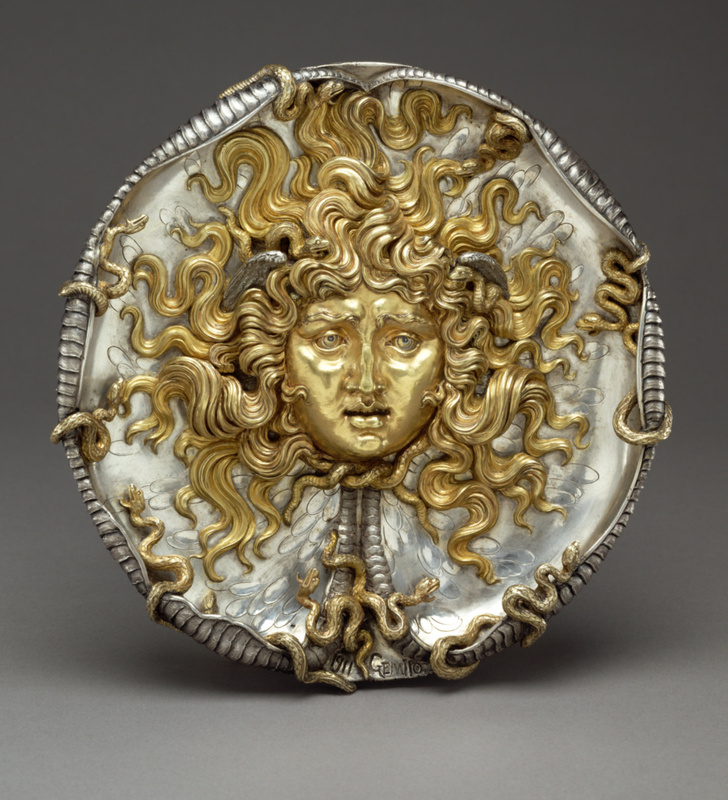 "Medusa as a Muse for Vincenzo Gemito (1852-1929)." The J. Paul Getty Museum Journal 16 (1988), pp. 127-32. González-Palacios, Alvar. Il Velo delle Grazie (Turin, 1992), pp. 88-89, pl. 11. Turner, Jane, ed. The Dictionary of Art (New York: Grove, 1996), vol. 12, p. 268 (general mention, entry by Peter Ward-Jackson). The J. Paul Getty Museum Handbook of the Collections. 4th ed. (Los Angeles: J. Paul Getty Museum, 1997), p. 273, ill.
Fusco, Peter. Summary Catalogue of European Sculpture in the J. Paul Getty Museum (Los Angeles: J. Paul Getty Museum, 1997), pp. 1, 25, ill.
Fusco, Peter, Peggy Anne Fogelman, and Marietta Cambareri. Masterpieces of the J. Paul Getty Museum: European Sculpture (Los Angeles: J. Paul Getty Museum, 1998), pp. 126-27, no. 47, ill., entry by Peter Fusco. The J. Paul Getty Museum Handbook of the Collections. 6th ed. (Los Angeles: J. Paul Getty Museum, 2001), p. 273, ill.
Fogelman, Peggy, and Peter Fusco, with Marietta Cambareri. Italian and Spanish Sculpture: Catalogue of the J. Paul Getty Museum (Los Angeles: J. Paul Getty Museum, 2002), pp. 338-43, no. 43. Fogelman, Peggy, and Peter Fusco, with Marietta Cambareri. Italian and Spanish Sculpture: Catalogue of the J. Paul Getty Museum Collection (Los Angeles: J. Paul Getty Museum, 2002), pp. 338-343, ills. 43, 43B, 43D. The J. Paul Getty Museum Handbook of the Collections. 8th ed. (Los Angeles: J. Paul Getty Museum, 2015), p. 318, ill.